Landmark Commercial Real Estate strives to be the premier full service real estate and office space brokerage firm in Wichita. Landmark Commercial Real Estate, has extensive experience in leasing retail, office, restaurant and industrial properties. We represent both Landlords and Tenants. Our extensive experience with both sides of the transaction gives us added insight in negotiating transactions that work for both parties. Landmark Commercial Real Estate maintains a large property database, which we utilize to provide Tenants with quick and reliable information. Landmark is also experienced in all phases of commercial real estate development including evaluation, conception, site selection, site planning, developmental services, construction management and leasing. Landmark was founded in 1993 by Bradley Saville, CCIM, after Saville had spent 4 years in property management, leasing and brokerage from 1989-1992. Landmark Commercial Real Estate Inc. has evolved into the 2nd largest real estate company practicing solely commercial real estate in Wichita, Kansas, and has also developed medical and industrial divisions. “We pride ourselves in our success in focusing on leasing and marketing properties for sale, lease and development." Many of the properties we handle are owned by institutional owners, investors and developers, who demand a high level of reporting and results. “We are selective in the Listings that we accept, as we provide a commitment to results through implementation of a strategic marketing plan on every property.” Landmark Commercial Real Estate has licensed agents, an administrative staff, a photographer and graphic designer with in-house color laser printing. We have the ability and the staff to handle the demand new listings require to execute a marketing plan. We look forward to serving you. 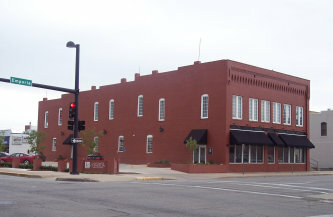 Landmark Commercial Real Estate strives to be the premier full service real estate brokerage firm in Wichita, Kansas. Utilizing a team approach to real estate transactions allows us to utilize the knowledge and abilities of several team members to provide the highest level of service to the client or customer. Feel free to call or email us for more information, or visit our web site to view our available properties.